For Sheva Brachos, Engagement parties or any other occasion, at your home, simcha hall, or location of choice, the kosher caterers listed below will serve you up delicios dishes for your table. Follow this link for kosher caterers specializing in weddings. 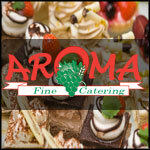 Since 2006, Aroma Fine Catering has been creating exceptional and delicious menus for any occasion - large and small. If you are looking for a combination of fresh, delectable cuisine and unparalleled service - it's Aroma!